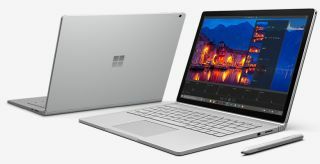 Microsoft has offered up more specific details on which processors are in each version of the Surface Pro 4 and its first laptop, the Surface Book. Both are using ultra-low power 15 watt chips. The part we're really curious about, however, the Surface Book's Nvidia GPU, is still a bit of a mystery. The high-end version of the Surface Pro 4 tablet has a dual-core 2.2 GHz Intel Core i7-6650U Skylake chip, along with an Intel Iris 540 GPU. The next step down has a 2.4 GHz i5-6300U with Intel HD Graphics 520. The cheapest option will have a 900 MHz Core m3-6Y30 with Intel HD Graphics 515. As you'd probably expect from a Surface tablet, those low-power GPUs will be able to play games on low settings, or handle older, less demanding small games fairly well. Meanwhile the Surface Book will be slightly faster. The screen of the premium laptop disconnects from the base to form a “clipboard”, which has a Core i7-6600U chip in it, along with an Intel HD Graphics 520 GPU. In the cheaper option you’ll get a 2.4 GHz Core i5-6300U with Intel HD Graphics 520. We'd prefer 2GB of VRAM, but we're still curious what kind of performance the GPU will be able to squeeze out. The Surface Book starts at $1,500, up to $2,700 for the most expensive version. The Surface Pro 4 starts at $900, up to $1,600.